Don’t you just hate it when APIs are failing and you have absolutely no clue why? Now imagine you don’t have access to the VM, cluster or container where your software is running. Want me to continue with this nightmare? Yes, that’s what debugging AWS Lambda functions tends to seem like. A horrid nightmare of not knowing what is happening nor why things are failing. This article will show you a way of logging function invocations. Letting you track and monitor failures and errors, while also giving you a nice structure for logging info and debug logs for when you need to troubleshoot behavior. The key is to send all logs to a central location where you can later group, filter and make sense of them. Sematext is a full-stack observability solution for your entire software stack. Meaning you can implement function logging alongside any existing infrastructure, like Kubernetes clusters and containers. CloudWatch collects monitoring and operational data in the form of logs, metrics, and events, providing you with a unified view of AWS resources, applications and services that run on AWS, and on-premises servers. In layman’s terms, it’s an AWS service for showing your logs across all AWS services. We’re interested in knowing how it handles AWS Lambda logs. When a Lambda function executes, whatever you write out to the console, a fmt.printf() in Go or console.log() in Node.js, will be sent to CloudWatch asynchronously in the background. Lucky for us, it won’t add any overhead to the function execution time. Let’s take a step back and look at the bigger picture. Every function will create something called a Log Group in CloudWatch. Click on a particular Log Group. These log groups will contain Log Streams that are literally equivalent of log events coming from particular function instances. This is hardly a good enough solution for system insight and having proper overview of what your software is doing. Because of its structure it’s incredibly hard to see and distinguish logs. Using a central location for your logs makes more sense. You can use your own Elasticsearch or a hosted setup. Sematext gives you full-stack observability for every part of your infrastructure and exposes an Elasticsearch API. Let me show you how easy it is to create CloudWatch log processing of your AWS Lambda functions and pipe them to a Sematext Logs App. 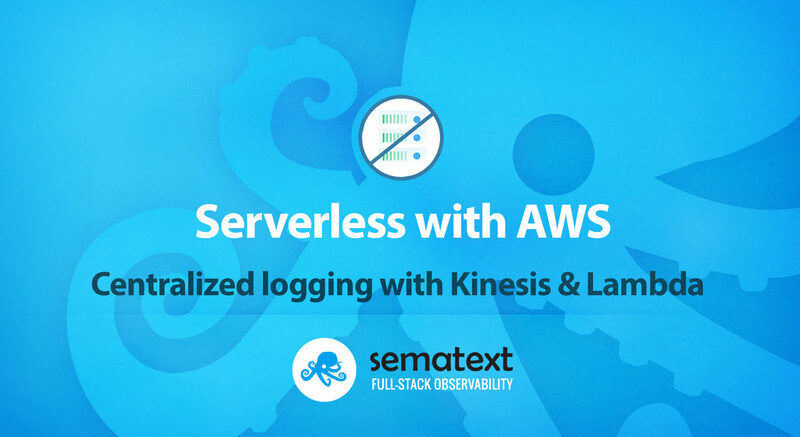 By using CloudWatch log group subscriptions and Kinesis you can funnel all of your Lambda logs to a dedicated function that will ship them to Sematext’s Elasticsearch API. There you have a central location for all your logs. You can search and filter logs for all functions and with little effort have insight into the behavior and health of your functions. I’ll demo how to build a one-command-deploy solution you can use for yourself. It’s built with the Serverless Framework and Node.js. But, you can feel free to use AWS SAM or Terraform, and any programming language you want. The concept will stay the same. Here’s what it will look like in the end. Much prettier than CloudWatch, and you can actually find what you’re looking for! First of all install the Serverless Framework, configure your IAM user, and create a new project. Full guide can be found here. Let’s break it down piece by piece. The shipper function will be triggered by a Kinesis stream, and it has some environment variables for configuring Sematext Logs. The Kinesis stream itself is defined at the bottom, in the resources section, and referenced in the function events by using its ARN. Moving on to the subscriber function. It can be triggered in three ways. It’s up to you to choose. If you have a lot of existing Log Groups, you may want to hit the HTTP endpoint to initially subscribe them all. Otherwise, having it trigger every once in a while, or only when a new Log Group is created, would be fine. The LogsKinesisStream is the Kinesis stream to where we’re subscribing Log Groups, and CloudWatchLogsRole is the IAM Role which will allow CloudWatch to put records into Kinesis. With that out of the way, you can now see we’re missing a secrets.json file. But, before we continue, jump over to Sematext, log in and create a Logs App. Press the tiny green button to add a Logs App. After adding the name of the App and some basic info, you’ll see a waiting for data screen pop up. Press the integrations guide and copy your token. I like saying Kinesis is a simpler version of Kafka. It’s basically a pipe. You subscribe data to be sent into it, and tell it to trigger a Lambda function as an event, once it satisfies a certain batch size. The purpose of having a subscriber function is to subscribe all Log Groups to a Kinesis stream. Ideally they should be subscribed upon creation, and of course, initially when you want to subscribe all existing Log Groups to a new Kinesis stream. As a fallback, I also like to have an HTTP endpoint for when I want to manually trigger the subscriber. Check out the processAll() function. It’ll grab all Log Groups from CloudWatch which match the prefix, and put them in an easily accessible array. You’ll then pass them to a subscribeAll() function, which will map through them while subscribing them to the Kinesis stream you defined in the serverless.yml. Another cool thing is setting the retention policy to 7 days. You’ll rarely need more than that and it’ll cut the cost of keeping logs in your AWS account. Keep in mind you can also edit the filterPattern by which logs will get ingested. For now, I’ve chosen to keep it blank and not filter out anything. But, based on your needs you can match it with what kind of pattern your logger of choice creates. Sweet, with that done, let’s move on to shipping some logs! After the Kinesis stream receives logs from CloudWatch, it’ll trigger a Lambda function dedicated to sending the logs to an Elasticsearch endpoint. For this example we’ll use LogseneJS as the log shipper. It’s rather simple if you break it down. A batch of records will be sent in the event parameter to the shipper function. You parse the logs, giving them your desired structure, and ship them to Sematext. Here’s what it looks like. Create a new file, name it shipper.js and paste this code in. The parseLog() function will skip the START, END, and REPORT log events entirely, and only return user-defined log events as either debug or error based on if they’re user-defined stdout or any type of error in the function runtime, configuration or duration. The code in the shipper is configured to work with the structure above or with a structure that only has the message part. If you’re using another runtime, I’d advise you to use structured logging to have a common structure for your log events. With the coding part done, you’re ready to deploy and test your custom log shipper. You’ll see output get printed to the console. That’s it. You now have a setup for shipping all logs from your Lambda functions into Sematext Cloud. Make sure to trigger the subscriber function to subscribe the Log Groups to the Kinesis stream. After triggering the subscriber you’ll see the logs the subscriber generated in Sematext, and you can rest assured it works. The Kinesis cost is split into shard hours and PUT payload units the size of 25KB. One shard costs $0.36 per day, while one million PUT Payload Units cost $0.014. Hypothetically, if you have one shard and 100 PUT payload units per second that’ll end up costing you $10.8 for the shard and $3.6288 for the payload units during a 30 day period. The Lambda functions are configured to use the minimum amount of memory possible, 128MB, meaning the costs will often stay in the free tier during moderate use. That’s the least of your worries. Having a central location for your logs is crucial. Even though CloudWatch is useful in its own way, it lacks in the sense of overview. By using a central location you don’t need to switch contexts for debugging different types of applications. Sematext can monitor your whole software stack. Having your Kubernetes logs, container logs and Lambda logs in Sematext Logs where you can easily keep track of everything is a major benefit. If you need to check out the code once again, here’s the repo, give it a star if you want more people to see it on GitHub. You can also clone the repo and deploy it right away. Don’t forget to add you Logs App token first. If you need an observability solution for your software stack, check out Sematext. We’re pushing to open source our products and make an impact.